Fill up your B12 stores! Among the vitamin B12 preparations, vitamin B12 tablets today represent one of the most frequently chosen dosage forms and are well documented in their effectiveness. (1) Andres, E., Dali-Youcef, N., Vogel, T., Serray, K. and Zimmer, J. (2009), Oral cobalamin (vitamin B12) treatment. An update. International Journal of Laboratory Hematology, 31: 1-8. doi: 10,1111/y.1751-553X.2008.01115. Vitamin B-12 is vital and can support the body in the production of energy (conversion of carbohydrates into glucose). It is involved in cell division and can help maintain the health of nerve cells. 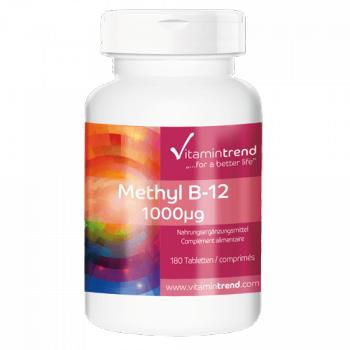 B-12 also contributes to normal functioning of the immune system and is important for blood formation.